*Busy, lazy, procrastination… in addition to a whole heap of other synonyms to explain / excuse my lack of commitment to running these days. As you’ll know, I’ve taken a break from the half marathon distance for the summer with my biggest race being the Vitality British 10km in London on Sunday 10th July. So I’ve come up with a training plan, a really basic one, that I can hopefully adhere to. 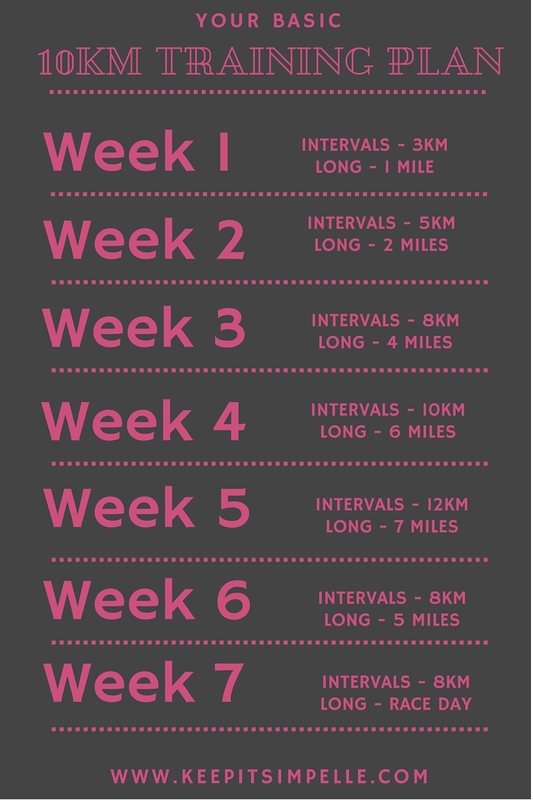 It’s so simple, based on just two runs per week, one long run and one interval session. The Interval Sessions – Intervals are used to increase anaerobic threshold levels (your ability to run hard without going into an oxygen deficit). These sessions also improve your endurance (the length of time you can hold your pace), and help to build muscle strength. There are so many variations of intervals you can run but I will mix up my sessions with both long (800m – 1500m) and short (200m – 400m) intervals. Once I get closer to race day, I’ll be doing more long intervals than short. I’ll run these intervals at 10kmph (a 60 minute 10km pace) and faster. Rest periods will be approx half the distance for a long interval, and the same amount of time for the effort of the short interval. I’m currently on week 3 of training, but still actually have to catch up on week two (I know, I know). I kicked off with a 3.68km run around London with Olympic Athlete Perri Shakes-Drayton who has just been announced as the official race starter for the British 10km. This counts as my week two long one, so I just need to do two short interval sessions and 4 miles for a long run to fully catch up (I have the Olympic Park 5km booked for this Sunday so that will do!). I’m using my TomTom Runner 2 Cardio & Music to track all my training – I think it automatically uploads to Strava too so you can join me on there if you’re into that kinda thing or are also training for this race! I’ll be mixing up my interval sessions with classes at Barry’s Bootcamp, 1Rebel, Best’s Bootcamp and FRAME whose classes all incorporate lots of fast treadmill running and some strength work. One of the main reasons I’m only running twice a week is because there are so many other things I want to do too including Reformer Pilates, road biking, spin classes and HIIT training. There are only seven days in a week sadly, and rest also needs to be scheduled. What kinda 10km training plan do you usually use?! Ever run just twice a week?! Ooh, I have a 10k on Sunday! I ran about 3-4 times a week but I can see this plan working. Since I'm on the other side of the world I think I'll have to pass on your race but good luck! It sounds like a fun one!